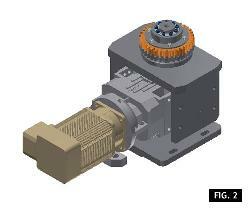 This upgrade consists in the replacement of the whole transmission group of the blowing wheel motor, with a newgeneration one, in which the driving system, the belt tensioning and the junction of the different components have been revised. 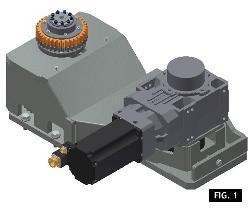 The new application features a new belt between the gear-motor and the transmission to the machine. The addition of the above mentioned elements isolate the brushless motor from the rotation unit, thus protecting it from vibrations and shocks, which prejudice its performance and duration. 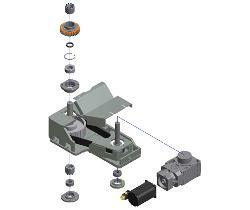 Moreover, the motor is installed on a sliding table; therefore, it is possible to adjust the belt tension according to the situation in which the machine is operating. Another important innovation is the introduction of a locking device instead of the traditional coupling key, in order to lock the shaft to the gearbox; this system ensures uniform pressure on the driving shaft and high resistance to shocks and vibrations. The picture Fig. 2 shows the difference of the new group as compared to the previous one; it is easy to see the advantages ensured by the belt, functioning as a “shock absorber” between the roller bearing and the driving pinion applied to the reducer. All machines, except SR 8 (1st series). If the a.m. transmission has already been installed, verify the upgrades ZF010027 and ZF010028, in order to make sure you possess the latest release, including the sliding table and the locking device..
- Simplified replacement of the motor, which can be easily unlocked from the gearbox.